Poker remains to be one of the highly played games in iGaming. This popularity extends to Bitcoin gambling. Ever since the first cryptocurrency surfaced, several online poker rooms emerged. This hopes to bring more excitement with Bitcoin poker. If you’ve been playing online poker, then you should have an easier time playing poker with Bitcoin. If you want to start, make sure you know the tips and techniques to win. Choose from the list of top poker sites below the poker rooms you want to check out. Always remember that poker isn’t just about luck. It requires all the skills you can master to inch your way closer to winning the pot. Poker legends don’t just wing it so that they win thousands of dollars in an event. If you want to find more bitcoins in your account, you’d better start learning a poker strategy or two. You’ll find several poker strategy and tips to win, but the key point to keep in mind is that they don’t guarantee sure wins. What these strategies assure you of is that you’ll likely to make the right decisions that will push you to eventually win in a cash game or tournaments. If you ask seasoned players about their strategies, they can go on forever with how they go about different situations. But before going deeper, it’s best to stay on the fundamentals just like what the positions are at the table. Where you’re seated is a crucial factor. It tells you which moves to take at the beginning, during, and late into the game. This is the reason knowing what each seat means would be the perfect basic poker strategy. You will find yourself in three types of seats: the early position, the middle position, and the late position. 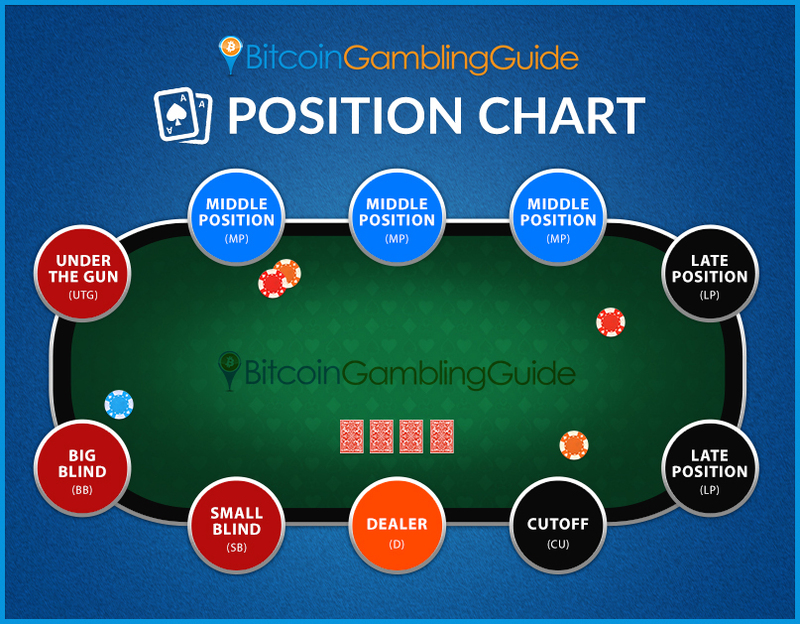 Ideally, you should only play with strong hands in the early position, play with good hands if in the middle, and play more cards if in the late position.Expect to experience playing in all positions since the Small Blind and the Big Blind rotate. Starting in the early position is intimidating for beginners, especially since they must act based on the little information that they have. The basic poker strategy here is that you will only play with premium hands. Otherwise, you fold. It’s a different playing field in the middle position since you should already know how the early position players fare in the round. Raising the ante is advised, but it becomes almost obligatory if you have a pair. Of course, the late position would be the best seats in the table since you get to observe every move of the other players. Make sure to maximize this poker strategy and boost your winning probability while seating in the late position. Playing poker without knowing the winning poker hands must be avoided. Going to the game unprepared is a ticket to zero bankroll at the end of the day. There isn’t much to learn about the poker hands as a winning poker strategy, except for the fact that there are 10 possible hands at the end of each round. The high card is the lowest ranked hand of the 10, while the royal flush beats the other hands on the table. 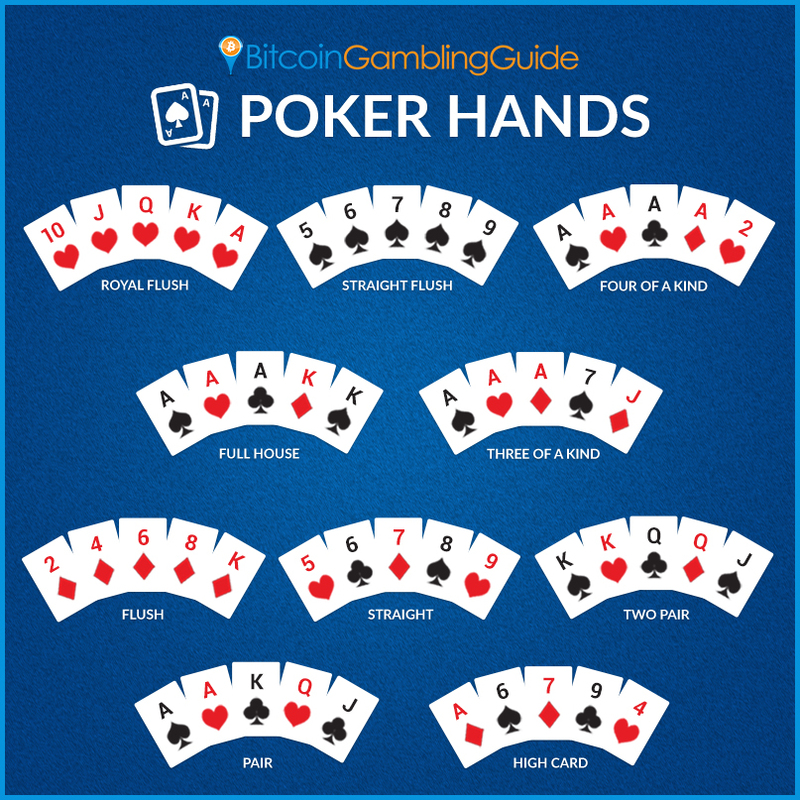 The secret to increasing your chances of winning is to know these hands by heart–this poker strategy is highly significant–since these will also determine how you should act once dealt two cards. Moreover, make sure to not mix up the ranking of the hands to avoid losing chips. Knowing the right time to play aggressively or passively is an essential poker strategy to perfect. After all, you can bluff once you perform these two kinds of play excellently. When you’re raising and betting, you’re being aggressive, and this is common early in the game among poker players in the late position. Passive play, on the other hand, is when you fold, check, or call. What you have in hand determines whether you’ll start aggressively or passively. For example, a pair automatically dictates that you should be aggressive, especially pairs of higher value. Raising would be the smart move, but this still depends on where you’re seated. 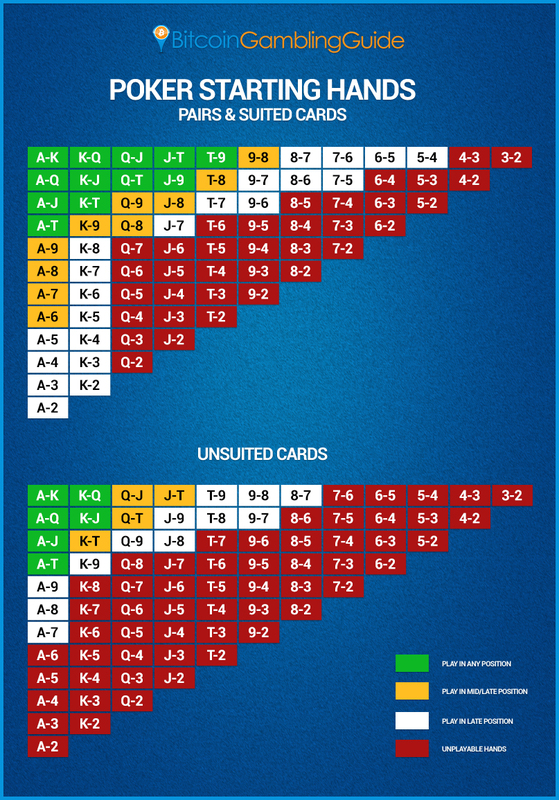 Check the chart below for the corresponding starting hands for pairs and suited cards. Make sure to take note of the unplayable hands in the red boxes. If you’re starting with these combinations, be passive and fold. There’s no use playing chips for a hand that won’t take you anywhere on the table. In the event that you’re starting with unsuited cards and you’re in the early position, keep an eye on these starting hands: A-K, A-Q, A-J, A-T, K-Q, and K-J. If you don’t have these starting hands, then folding would be the ideal action to take in the beginning. Playing smart in poker isn’t the only poker strategy to win. There will be games where you’d end up with a losing streak, but wise players don’t necessarily always end up broke. At the other end of the spectrum is your poker strategy to effectively manage your bankroll. This is why you’d normally see money management systems listed as a poker strategy, even when playing Bitcoin poker. If you’re still looking for the most applicable poker money management, then you should be prepared to maximize your playable amount in the safest way possible and close the round with a win. The primary concept to understand with this poker strategy is that you should be flexible in moving the limits up and down. In this way, you can push the amount of bitcoins you can win while also lessening the risk of huge losses. Also, see to it that you stay in line with money management and be strict about it. Otherwise, expect having difficulties maintaining your bankroll at a desirable level. It’s also worth noting as a poker strategy to stay playing in a good game. Breaking your streak can be lethal, so play on as long as you’re on the good side of things. But if you’re having a bad game, leave the table and save your bitcoins for another day of poker. And this could’t be the most basic poker strategy. Of course, all of these poker strategy and techniques aren’t foolproof, and this is what you should always keep in mind. Finding your own poker strategy or even learning how to risk by playing differently—just like how Michael ‘The Grinder’ Mizrachi normally does—might actually be better instead of staying in the current just like any other Bitcoin poker player out there. And the best poker strategy to take with you to every cash game and tournament online is to play responsibly while having fun.